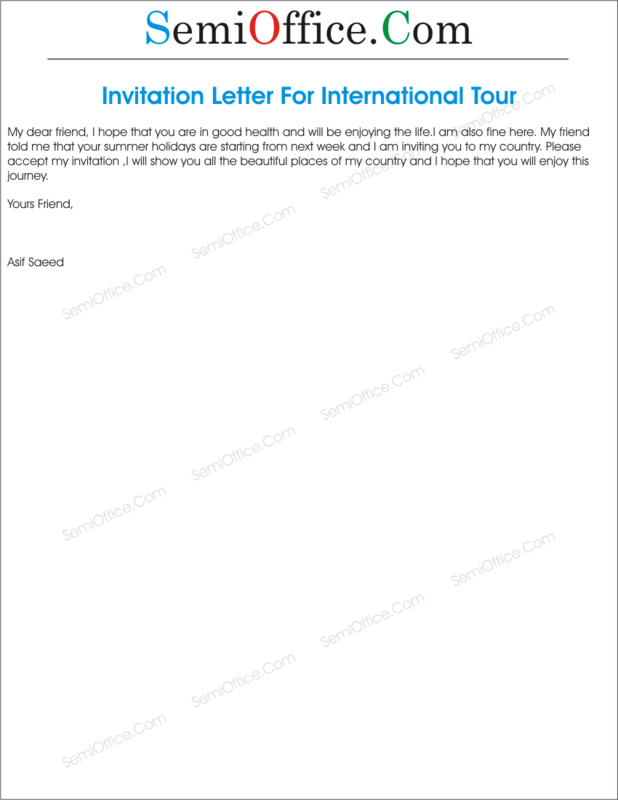 Sample invitation letter to invite your friend, family member, cousin or someone else for visit, meeting, interview or any other purpose from abroad. I hope that you are in good health and will be enjoying the life.I am also fine here. My friend told me that your summer holidays are starting from next week and I am inviting you to my country. 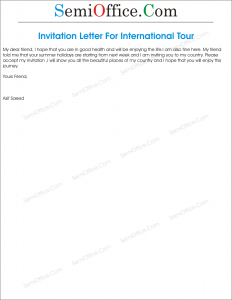 Please accept my invitation, I will show you all the beautiful places of my country and I hope that you will enjoy this journey. How are you my friend? I hope you would be doing great. Do tell me about your health. I am writing to you after three months because I was busy in completing some major assignments before the Christmas. I hope you understand my situation and will not be angry at me. Even if you are angry I have a brilliant plan to make you happy. I want you to spend this Christmas and New Year with me at my place. I am totally free from my college and have no other work. I am sure you are also having holidays for this occasion. We both would enjoy a lot with other friends. It would be great to celebrate this New Year with you. I have made many other plans and I will let you know when you will come here. Please reply me as soon as possible and confirm your flight as there would be many international flights during next week for this occasion. I hope that you are doing fine and I pray that you have the best of health and happiness. The purpose of writing this letter to you is that I am immensely missing you and I really want to see you. Last night I was looking at our pictures from school and after that I have planned to meet you but the problem is that I cannot come because of my heavy duty job but as your job allows you to have days off in a flexible way, I want you to come and see me so that we can refresh those good times.